Crossfire Highlight: Should Giuliani be painted with the same brush as Bill Clinton? This news analysis was written for CNN Interactive. 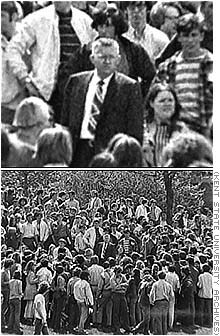 KENT, Ohio (CNN) -- Robby Stamps and I stood in a parking lot, a place where his life changed forever. Stamps was a 19-year-old sophomore at Ohio's Kent State University when he attended a Vietnam War protest on May 4, 1970. It was the fourth day of protests by Kent State students following President Nixon's announcement that U.S. troops were being sent into Cambodia. Stamps was one of hundreds of students tear-gassed on the campus that day by National Guard troops brought in to quell the unrest. Stamps had decided to leave the demonstration and was walking through the parking lot when he heard gunfire. He started running but was hit in his back by a bullet. The next thing he knew he was being carried into a dormitory. He was rushed to the hospital, where he learned shortly after arriving that four students had been killed and more injured. He was in the hospital for nearly a month. Stamps recovered physically from that gunshot. But he -- and many others in the nation -- are still dealing with the psychological impact of the shots fired that day. Kent State's campus in northeast Ohio is tranquil, with tree-covered rolling hills. But at the 30th anniversary of the shootings here, you feel the ghosts of 1970. In the parking lot where Stamps was wounded, four places are blocked off, surrounded by small memorial light posts. There's a marker on each spot, each with a name: Allison Krause, Jeffrey Miller, Sandra Scheuer, and William Schroeder -- the students killed by the National Guard that day. Why were they shot? To this day, there are conflicting stories and unresolved questions. Even after 30 years and several investigations, there are still no official conclusions on what led to the bloodshed. And several conspiracy theories persist. At least 28 guardsmen fired at least 61 shots in 13 seconds, according to court documents. Some of the guardsmen said later they felt their lives were being threatened by a menacing crowd. Others said they thought they were being fired on by students and fired back in self-defense. There has been no evidence of gunfire other than the shots from the National Guard. None of the students shot was closer than 100 yards to the Guard members. The fact that the Guard members carried live ammunition shocked the protesters and students covering the protests as journalists, along with many people across the nation. Bob Carpenter, a radio reporter at the time, and Paul Tople, a newspaper photographer, believe inexperienced Guardsmen panicked. John Darnell, who was taking a news photography class and had his camera with him that day, goes further, claiming some of the National Guard members committed murder. Federal charges were filed against eight of the Guardsmen, but citing a lack of evidence, a judge dismissed the charges. An out-of-court civil settlement was ultimately reached, splitting a total of $675,000 among the families of the dead and the nine people wounded. The Guardsmen who fired shots signed a statement of regret. Most of the seniors currently at Kent State were born nearly a decade after the shootings at their school. Most of the students I talked with during my visit to the campus said they were horrified about what happened there in 1970, but many also said it was hard for them to relate to the virulent anti-war passion of those times. Kent State and its students have largely moved on, but the school's name will always be linked to a traumatizing, epochal event. It was the only time federal troops have shot U.S. students. 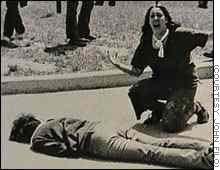 Some people, from today's students to yesterday's protesters to historians, believe the Kent State shootings helped turn the tide against the Vietnam War more than any other single event, and that the shift in attitude helped save lives. Many of the Kent State victims and their family members see that as an important legacy.